This tour features vineyard walks at superb wineries in Chianti, Montalcino, and Super Tuscan wine country. Visits to Florence and Siena, two of the most spectacular cities in Italy, are also included. You will have a private chauffeur and wine guide for the duration of this Luxury Tour, along with excellent local guides. The accommodation chosen for this tour is extremely luxurious, three of the most beautiful hotels in Europe and certainly in Italy. All are magnificently located in Tuscany’s unspoiled countryside. Your hotel in Florence is a 500-year-old Medici Villa, now a tiny luxury hotel where movie stars and musicians flock to. You’re likely to run into somebody famous at the pool or the bar here. Your hotel in Siena is a castle dating back to the 14th century. Originally a monastery (complete with cloister, gardens and adjoining villas), now it has been completely renovated to its former glory as a hotel and gained Relais Chateaux status. Finally, your historic hotel in the Maremma wine region (Southern Tuscany) is a chic 5* luxury Villa hotel. Centuries ago it used to be the hunting lodge for the Dukes of Tuscany and the property has been refurbished to its luxuriant and decadent past. This Maremma wine hotel is considered to be one of the most exclusive properties in Italy. It also boasts a restaurant run by famed French chef Alain Ducasse. Apart from sleeping in utter luxury, you will visit the exquisite cities of Florence and Siena, whose combined artistic heritage is more than most countries! Local art historians will lead you through the best galleries and museums (including the Uffizi Gallery) and you will have the chance to explore some lesser known jewels such as the Boboli Gardens and picturesque medieval villages. The cuisine featured on this tour is, as usual, a highlight. Dine in flawless Michelin Starred locales along with rustic, mom and pop trattorias. The restaurants are hand selected to show you the best Tuscany has to offer. The wines and specialties of Toscana are revered as being some of the finest. On this tour, you’ll taste vintage Brunello di Montalcino, “Super Tuscan” wines such as Petra and classic Chiantis from Radda. Delicious local dishes may include “Pappardelle a la Lepre” (pappardelle pasta cooked with hare) and wild boar cured sausage (“Prosciutto di Cinghiale”). The most famous Tuscan dish is the “Bistecca a la Fiorentina”, a huge T-Bone Tuscan steak usually big enough for two. And, to finish off any proper Tuscan meal, perhaps while you are dining al fresco at one of the gorgeous hotels included in this tour, you must try the “Cantucci with Vin Santo” (Macaroons and “holy wine”). Divine! If you are looking for a luxurious food and wine orientated tour of Tuscany, with the “Best of” highlights of the region’s art treasures, then this tour is for you. 5* Luxury Villa Hotel, member of "Leading Small Hotels of the World"
Your personal guide (specialized in wine) and English speaking driver for the tour will meet you at the airport, and you will transfer by comfortable Mercedes to your exclusive hotel, tucked away in a chic neighborhood, just south of Florence. 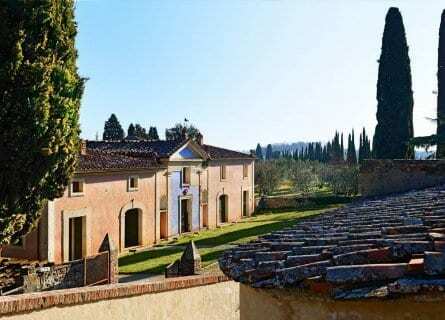 Arrive at your amazing hotel, a 16th century Villa which once belonged to the powerful Medici family. Numerous personalities have stayed here through the years including Winston Churchill, Elizabeth Taylor, and Clark Gable. You will be greeted with a welcome glass of champagne upon arrival. Florence awaits! After check-in, your personal chauffeur will take you into the historic center of Florence, one of the most beautiful cities in the world. 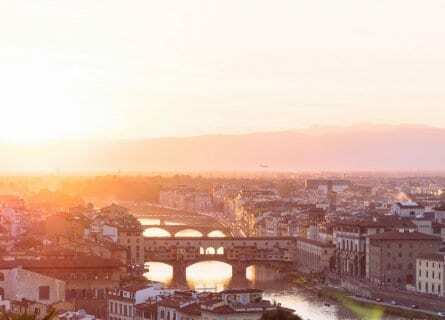 You will receive a private guided walking tour of Florence’s “Centro Storico” to include the Mercato Centrale (the mind-boggling food market), the Piazza Della Signoria (the gorgeous square where the Uffizi gallery, Neptune’s fountain and the Palazzo Vecchio are all located), and plenty of hidden gourmet gems en route. Lunch will be at a lively Enoteca (chic wine bar), where you will experience your first velvety wines of the tour. Evening transfer back to the luxury hotel and dinner on your own. A free morning to enjoy this splendid hotel. Late morning transfer to historic Florence. 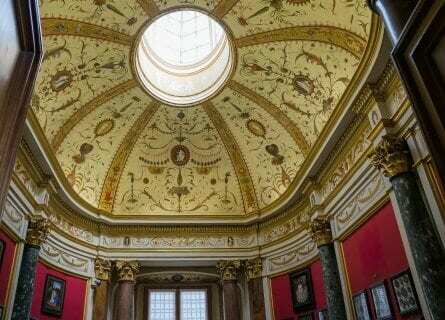 Visit the marvelous Uffizi gallery, one of the most famous art museums in the world, boasting Botticellis, Michelangelos and Da Vincis, unforgettable. For lunch, a gourmet lunch will be waiting for you at Pinchiorri in Florence, the crème de la crème venue to begin a Tuscan gastronomic journey (3 Michelin Starred venue, wine not included). Set in a magnificent Renaissance palace, there are over 150,000 wines in the cellar, stocked with French, Italian and Californian labels. In the kitchen, French chef Annie Féolde is known for her innovative flair and this is one of Italy’s most famed restaurants. After lunch, your local Florence guide will collect you from the restaurant and lead you on a unique walking tour (about 3 hours), taking in unusual corners, hidden squares, and interesting anecdotes. Your guide is a young charming historian. An evening to yourselves at the luxury hotel or taxi into Florence, with our dinner recommendations. Breakfast: Enjoy a luxurious Tuscan breakfast outside on the terrace overlooking the mighty Arno River and views of elegant villas lining the riverfront. Today will be a wine tasting extravaganza! Transfer from Florence towards Siena, via the most beautiful villages of the Chianti Classico region. Stop for a VIP winery visit at the most exclusive winery in the area. You will enjoy a professional tasting of the full range of wines with personalized tasting sheets and even a gift, signed by the winemaker. Lunch will be at a fun, local trattoria in a medieval village. Don’t miss a walk around the tiny walled village of Radda before continuing on your wine journey. After a scenic drive passing vineyards and tiny wine villages, the next stop is a visit to the perfectly manicured, hill topped village of Montalcino. This ancient village is best known for its elixir red Brunello di Montalcino wines, made with the Sangiovese Grosso grape varietal. A VIP private visit to an artisan Brunello producer will be organized for you (normally closed to the public), followed by a fantastic vertical tasting. After the tasting, you can take in an invigorating walk around the pretty village of Montalcino, do some gourmet shopping or pop into the ancient “Chiesa” (church) before heading to your spectacular hotel for the evening, a restored monastery, now a Relais Chateaux. Relax at the pool, in the historic library, or take a walk around the immense grounds full of olive groves and vines. Dinner on your own at the excellent hotel restaurant. Full Breakfast at the Relais Chateaux, served in a historic patio, surrounded by ancient trees. Morning visit to a prestigious Olive Oil and wine producing estate Fattorie di Felsina, a half hour beautiful drive from the hotel. You will see how the olive oil making process takes place, which is truly fascinating. An olive oil tasting will be given for you and each guest will receive a gift bottle of this famed olive oil (one of the best in Italy). Transfer from olive groves to the historic center of Siena, one of the noblest cities in Italy. The gorgeous 14th-century main square, called the “Campo”, is where the historic “Palio” races are held. You will receive a walking tour of the old town and have free time for shopping, or gallery hopping. A delicious 3-course lunch will be arranged for you in a fantastic local trattoria and served with lovely Vino Nobile di Montepulciano wine. Spend the afternoon in Siena, highlights include the 12th-century Gothic Cathedral (one of the most exceptional in Italy, with dazzling black and white marble) and the Pinacoteca Nazionale, Siena’s best art museum, housed in a 15th-century palace. Evening transfer to Relais Chateaux hotel and dinner to enjoy on your own. Full Breakfast at the Relais Chateaux, served in a historic patio, surrounded by ancient gnarled trees. Today, you will travel southwest, from Siena to Grosseto to the mythical Maremma Wine Region. 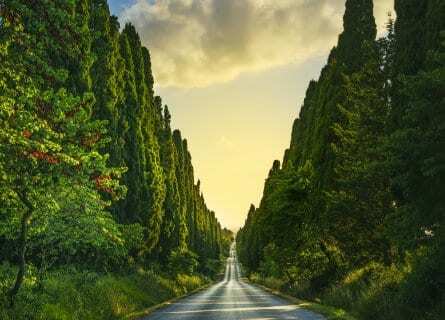 The 1 ½ hour drive leaves the cypress-covered hills of Siena and the landscape becomes more rugged but equally pretty. Maremma is the land of sunflowers and in season, they seem to cover entire hills. Your first stop will be at your beautiful hotel for the next 2 nights, a historic villa just outside of the charming fishing village of Castiglione Della Pescaia. Receive a welcome aperitif in the lovely sitting room or outside by the pool, while the porters take up your luggage. After check-in, you will travel north on a country road to the tiny wine village of Suvereto. Two extra special winery visits will be planned for you at 2 of the most famous Super Tuscan estates. 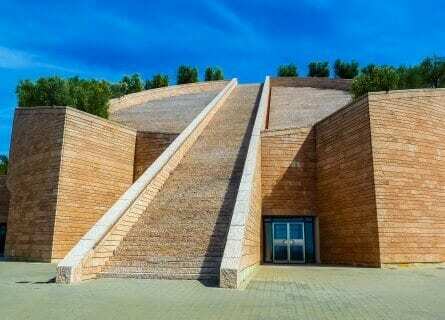 One is a super slick Napa-esque operation designed by well-known Swiss architect Mario Botta; the second is a family owned winery most famous for receiving 100/100 points from Robert Parker for the 2000 vintage. You will have a tasty light lunch at one of the cellars (Pecorino Cheese, homemade pasta, bruschetta) served with wine, of course. After the wine tasting, you will visit the perfectly preserved fortified hamlet of Massa Marittima. Dating back to the 8th century, this picturesque village is an entirely pleasant place to enjoy a café or a bicchieri di vino. Evening transfer to your luxurious country villa. Dinner on your own at the hotel (founded by famed chef Alain Ducasse) or nearby in Castiglione Della Pescaia. Full Breakfast, Farewell dinner (with various courses) and 3 different wines to pair with the dinner. Full breakfast at your elegant hotel. Morning visit to the famed wine village of Bolgheri to visit one of the most famous wineries in the world, very exclusive and difficult to get into (virtually impossible for the general public). 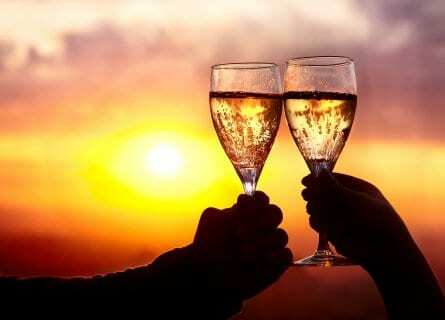 You will indulge in your special VIP visit and superb wine tasting. After the tasting, you will have your driver and guide on hand to take you wherever you like. We recommend the villages of Pitigliano or Castiglione Della Pescaia for sightseeing and the beaches of Monte Argentario for swimming and sailing. Late afternoon transfer to your beautiful hotel, to truly enjoy it. The 500-hectare estate has an elegant swimming pool, fields of sunflowers, a vineyard and even olive tree groves. Wine and olive oil are produced on-site. Enjoy an afternoon of Tuscan bliss in this beautiful property. Tonight, you have a treat in store! An amazing farewell dinner with keepsake menus (signed by the chef) will be arranged for you, with top quality wines. This will be a gastronomic highlight on the tour! Your chauffeur will take you to where your next port of call is. 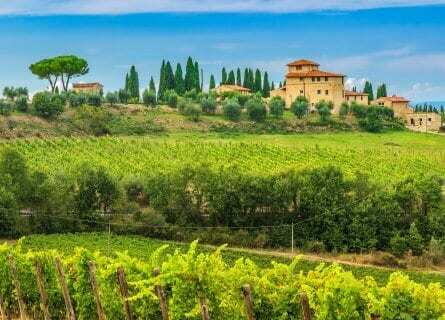 This concludes your ultra luxury wine tour of Tuscany, with wine tasting in Chianti, Montalcino and the Maremma. You will leave with many gourmet goodies and gifts, and above all with a deeper appreciation of Tuscan wines, art, and architecture. I can’t thank you enough for your caring and flexibility. The hotels were outstanding. The service aspect of each of the hotels was exemplary with exquisite care being given to every detail. Simone was also a delight. I was blown away by his knowledge of Florence and the Uffizi. I felt like I was walking with the encyclopedia Britannica. The restaurants…what can I possibly say? Pinchiorri is an experience one is not likely to forget. The food, the wine, the service – world class. This was our second trip with Cellar Tours and it was just as wonderful as our first. Last year we toured the Prosecco region outside of Venice and this year we toured the Chianti region outside of Florence. The Chianti tour was very professionally organized and our driver was prompt and spoke English very well. Castello Di Monsanto was a wonderful experience and we were given an informative tour of their wine-producing facility. We then had a fabulous wine tasting of 3 of their delicious wines. Lunch at Albergaccio was one of the best meals we have had in Italy and this is our 3rd trip to Italy. We were given a personalized menu by the owner and had a 4-course lunch with matching wines. My wife and I travel to Europe for the food and wine, and this was definitely a highlight. We then traveled the short distance to Fonterutoli to have another wine tasting at Castello di Fonterutoli. The wines we tasted there were superb and we had a chance to purchase some. The trip was as good as we had anticipated and we hope to be traveling to Milan next year, and if we do, we will surely contact Cellar Tours to organize our third trip. We have no suggestions to give because you seem to cover everything in your tours. Thanks for everything again. Hope to contact you next year. Everything was exquisitely arranged and organized according to our requests. I can’t think of anything you could have done better. The Four Seasons Florence was wonderful, worth every penny. Villa Armena – Beautifully done. The room was cozy and modern all at the same time. It was so peaceful and isolated we really enjoyed our time here. L’Andana – Jerry and I both liked this hotel the best. The combination of luxurious accommodations, spa services, and great food was outstanding. We enjoyed having champagne in the garden in the afternoon. Cibrèo in Florence was Fantastic. Really too much food, but we ate it all. The lunch at winery Beconcini – We enjoyed the homemade food and the conversation. Sauro was tremendous and took great care of us. He was punctual, courteous and professional. I have already recommended Cellar Tours to two friends. This was the most wonderful travel experience that we have ever had. We can’t even put into words how much we enjoyed our trip. Everything was organized in advance so that we didn’t have to make any decisions once we arrived. In my view, this is the only way to see Tuscany. We are looking forward to our next Cellar Tours experience!